History has been made.....Barack Obama has officially become the President-Elect and will become the 44th President of the United States on January 20, 2009. It was a super win for the Democrats, but even a bigger win for so many African Americans in this country. Barack Obama made history as he became the first black man to become President. How did he do it? 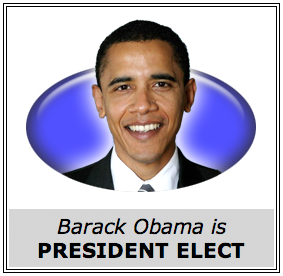 Well he crushed his opponent with both the popular vote and electoral vote. Per CNN "According to exit polls, Obama crushed McCain among women voters (56 percent to 43 percent); voters under 30 (66 percent to 32 percent); African-American voters (95 percent to 4 percent); Latino voters (66 percent to 32 percent); first-time voters (68 percent to 31 percent); and voters making less than $100,000 a year (55 percent to 43 percent)." When Indiana fell into Obama's column Wednesday morning, he had a 349-163 lead over his rival in electoral votes, with only 26 undecided. The popular vote was decisive also while Barack Obama won with 53% of the vote (63,944,551) while John McCain acquired only 46% of the vote (56,440,616). Tuesday marked the end of the longest presidential campaign season in U.S. history -- 21 months. Now, it's time to see who he picks to be in his Whitehouse staff.